What is your take on Party Poker's Virtual Coach? 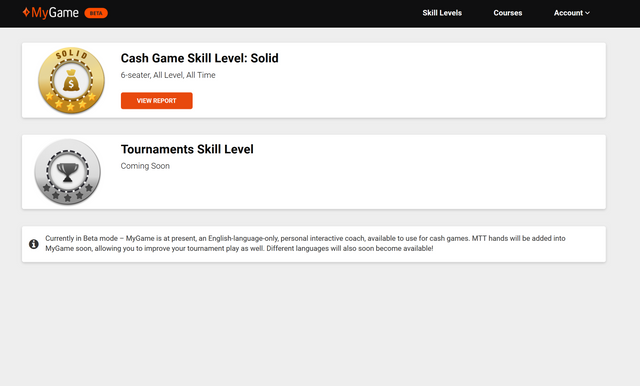 As some of you may not know, Party Poker has launched their virtual coach. Basically, all your hands played on Party (for Cash Games only, for Tourneys coming soon) are analysed on their cloud and you get a detailed report card with your level and leaks. Levels look like this. Leveling up is not only your play but also your winrate. Your winrate often times is outside of your control and at the whims of the pokersite. Here's an overview of my game. You can see a decent sample of 70k hands. I am rated as a winning player. Only my showdown is rated poor. I think you can see where I am going with this. For clarification, "B" is actually very strong grade in virtual coach. "A" is considered fine-tuning but Bs are very solid. Anyway, needless to say that I am losing left, right and centre on that poker site, including rakeback. I am incurring very heavy losses. Just about ready to quit. I am not willing to scale down stakes, as the rakeback is just not worth it. I'd rather deposit it elswhere and take advantage of welcome bonus. Here are showdowns expanded to provide a clearer insight. I am not saying my game is perfect. Of course I have leaks, but according to this I should be winning and fine tuning my winrate for increase. I am not even breaking even. I am getting hammered!! Can anyone explain to me this discrepancy? Similar Threads for: What is your take on Party Poker's Virtual Coach? re: Poker & What is your take on Party Poker's Virtual Coach? Sounds like a bad run, just take a break and then keep grinding. It will turn around. I wish to be honest. But no. I have been grinding there good 9 months and I am losing. I did not want to believe it but personally I think the site is iffy. I know, everyone will say "How dare yoy to accuse such a long running poker site. You are a bad player that blames the poker site, again. "I am short 15 sets from over 3,000 pocket pairs seeing the flop. Even though stats on party poker check out in long run, well sort of, it is always slightly below. Something doesn't feel right. You can hit set 1 out of 7.5. Sure, but when consistently players fold on the flop or turn when you start inflating the pot. And in turn, when they hit set you have 2 pair or you have TPTK in BB after defending agaisnt LAG. On the same day a reg. called my $8 or so 4bet with 66. I had AA. He flopped a set!! Needless to say I lost the buy in. Imagine that! I hadn't flopped a set during that session in 25 flops and he "miracously" flops a set against aces calling a 4bet!! This was a regular, needless to say this move should be seriously -EV. It's just weird. I personally believe, and yes it is a conspiracy theory, that party poker has a secret department (either people or bots) that play on the site to extract money for the company. Think about it, you cannot collect long term stats on cash players, only session stats. You cannot see the players' Won at Showdown. I am convinced that on Party Poker many players stats would be abnormal long term. I will never play again on a poker site that doesn't provide complete poker hand histories again. You cannot check for abnormalities. It is the perfect carte blanche for poker rooms. They can do whatever they want. They will give a story that they are certified, etc. If you don't have complete hand histories with names don't play there! I am taking my money out on Monday. I am done with them. Wasted 9 months there.